Paul Huang showed romantic style and an affinity for Franck in his recital April 17 at the Phillips Collection. If Huang treated pretty much everything on Sunday’s program with some variation of that fat, vibrato-rich romantic style, the music didn’t emerge the worse for it. A late-baroque Chaconne by Tommaso Antonio Vitali arrested attention in Huang’s larger-than-life reading, lending a Paganini-like verve to this early-music showpiece. And in Stravinsky’s modernist “Fairy’s Kiss” Divertimento, the violinist’s lush approach added alluring color to its spiky writing without blunting its impact. Although he allowed hints of edge and throatiness into his sound during the furious opening arpeggios of Arvo Part’s “Fratres,” subsequent arpeggios were beautifully turned, harmonics were exquisitely produced and his ripe phrasing lent this late 20th-century minimalist classic more than a hint of Cesar Franck. 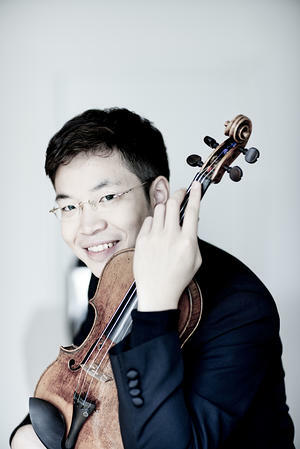 When an actual Franck piece — the 1886 Violin Sonata in A — closed the program, Huang was fully in his element, with openhearted, commandingly virtuosic playing, and a dark, almost violalike timbre that really dug into the work’s restless emotional arc. Osborne was a model of restrained passion in the Franck, and throughout the recital gauged her phrasing with great perception and subtlety — always articulating the musical arc, but never hogging the spotlight.